It has been an honour to be the MP for the Rhondda since 2001 and I am enormously grateful to everyone who voted for me and for Labour on 8th June. 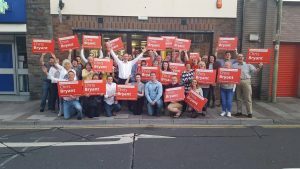 We – the whole Labour team – achieved a stunning result, nearly doubling the Labour majority and bringing in 64% of the vote. I would like to thank you whether you’re a Labour voter who has never wavered, a new Labour voter who was attracted by Jeremy Corbyn and the Labour manifesto, someone who normally votes Plaid but wanted to …stop the Tories in their tracks, or someone who thinks I do a good job. I take my hat off to the national party, to the party staff, to Jeremy Corbyn and to my wonderful colleagues in the PLP. There is a tough task ahead of us. The Tories, through their arrogance and sense of entitlement have lost seats and lost their majority in the Commons. They may still form the government, but we can win battles day by day if we remain focused and united – a task to which I pledge myself. Here in the Rhondda we desperately need to win battles – for more investment, for pension justice for the WASPI women, for stronger public services, for a Brexit deal that works hard for us all. If you are attracted to what we have achieved locally or nationally, why not join the party today?